A streaming device connects television or home theater to the internet and allows streaming of videos and music from online services. Any streaming device can be reset manually by holding the Reset button on the device for a while or by using the home application of the device on your android mobile. For example, the Roku Box or Streaming Stick can be reset to the factory settings by pressing and holding the reset button and the soft reset for the same is carried out by clicking factory reset option under the settings menu in the home application. A streaming device may encounter login issues, faulty codes, playback speed issue etc. which require the device to be reset to its factory settings. Look for the reset button on the streaming device and hold down the button for a while to hardset the streaming device. To soft reset a streaming device, for example, a Roku device, go to the Settings Option in the home application of the device. Click on the Advanced System Settings option followed by Factory Reset option. You will be provided with a code. Enter the code on the reset screen and click OK. Follow the on-screen instructions to reset the streaming device. To soft reset Chromecast, open the Chromecast home application on your smartphone. Tap the Factory Reset option under the settings menu and confirm your choice by tapping OK.
To perform a hard reset on Chromecast, press and hold the reset button present on it. When the orange light turns white, release the button. The device will be reset. The reset button position differs from one streaming device to another. Some old Roku devices require a pin or a paper clip to reset it. The newer Roku devices have a labeled reset button. Certain streaming devices can access only one Wi-Fi network at a time. 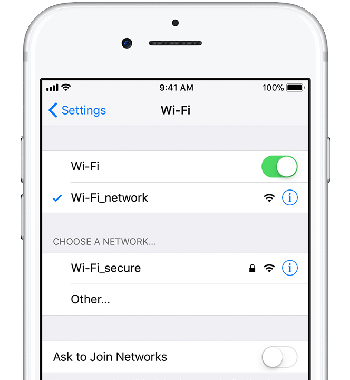 The streaming device and your mobile device should be able to connect to the new Wi-Fi network. The following instructions are for Chromecast and Roku device. Turn on your the Chromecast device. Download chromecast application on your mobile device and start the application. Open the application and connect to the chromecast device. Tap the network entry. A new popup window showing current network information appears. Touch the current network to get a list of available networks. Select the new network that you want use and provide the password to access it. To confirm your choice touch OK. The Chromcast can be connected to the new Wi-Fi now. Connect the Roku device to your television and press the Home button on the Roku remote control. Under settings option, select the Network option followed by Repeat Guided setup. Scroll down to Wireless option. From the list of networks provided, choose the new wireless network that you want to use. Provide the WPA key or WPA password and move down to select Done. A streaming device can be reset to the factory settings either by soft reset or by hard reset. If you have carried out a soft reset on your streaming device, try doing hard reset. Press the reset button on your streaming device and hold it for a period of time, your streaming device will reset. If the reset still does not work, make sure you are using the wall adapter and power cord provided by the manufacturer. Use the HDMI extender supplied by the manufacturer. Disconnect the extender from your television, reboot the DSL/cable modem, wait for about 2 minutes, and connect to a wall outlet. Reboot your Wi-Fi router. Connect your streaming device to a power supply and hard reset it by pressing the reset button for at least 25 seconds. Any streaming device requires an account to be created on the computer or smartphone. The account can be logged in using a valid email address. If the password has to be reset, the user should have access to the registered email addresss. For Roku devices, go to roku.com page on your computer or smart phone. If you are already logged into your Roku account, sign out from the account. Open the Roku.com page again. Click on the Forgot Password page. Key in your registered email address and click Submit. You will receive a password recovery email in your registered mail account. The link will be valid only for an hour. Open the link and enter a new password under the Create a New Password field. Sign in into the Roku account using your new password. If you do not have access to your registered email account, contact the manufacturer’s customer support. You can contact our support team to help you in resetting your password.